Ilene: Jesse, thank you for doing this interview with me. 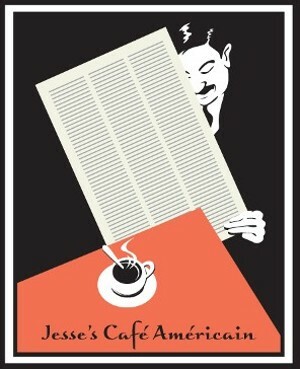 I’ve been visiting your Americain Cafe now for over a year and have greatly enjoyed the experience. Your site makes me feel like I’m in a real Cafe and have just picked up an interesting article to read with my coffee. However, as it is a virtual meeting spot, we haven’t been formally introduced yet. Will you tell me a little bit about yourself and how the Cafe got started? Jesse: I am pleased that you are enjoying the Cafe as it has been intended. Too much information about the markets and the economy is hurriedly snatched and gulped down, like American ‘takeaway.’ Sometimes it is valuable to sample information from diverse sources, taste it from different methods of preparation that do not hide its true flavor, and digest it properly. Otherwise we tend to move from bite to bite, with a broadly shallow appreciation of current events, driven by those who shape the mainstream menu offerings. In 2000 I had taken an early retirement from corporate work, where I had been a vice president at a Fortune 500 company. My intention was to take ten years off to study economics in greater depth, but primarily to spend more time with my family. I had always been fascinated with economics from the time I had studied it at the university when I went back for an MBA. I am originally an engineer by trade with a background in mathematics and the natural sciences, and while finance was my favorite subject, economics was a fascination. It was clearly a nascent science, full of competing theories, and struggling to find a footing. Even with my limited background, I could tell that we were approaching an historic period in economic history. The bubble in tech was obvious to anyone who was able to read a chart, and look at the rationale for the boom with a historically skeptical eye. I had started to study bubbles and crashes in 1998. One of the benefits of traveling for business is that one can become a voracious reader, and so I read quite a few books on bubbles and crashes to supplement what I already had known.